Burning daylight at the Karoo Tech Hub in Somerset East. 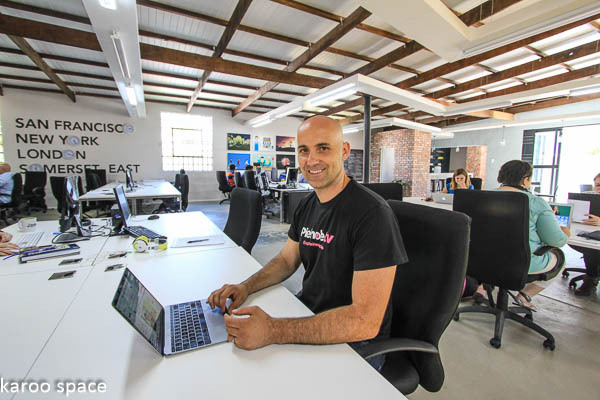 The Karoo Tech Hub is one of the South African platteland’s more unlikely industries. Based in Somerset East, the people who work there sometimes call it Karoogle. 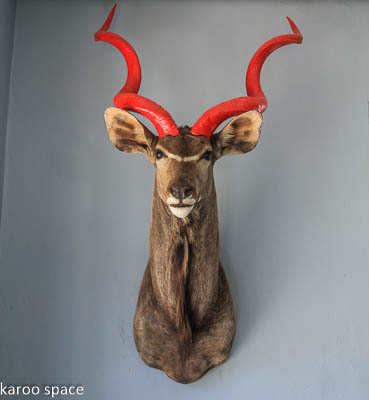 But not even Google head office in California has a kudu trophy with red-painted horns on its walls. And definitely no sign reading “Boer Maak ‘n Plan”. This is the brainchild of James Kennedy, his wife Priscilla and her brother George Groves. Priscilla and George grew up in the picturesque Eastern Cape town, at the foot of the green Boschberg mountain range. They lived the carefree lives of country-raised children, went fishing nearly every day at the local dam, and were educated at Gill College. Then, as so often happens with young South Africans these days, they went overseas to seek their fortunes. 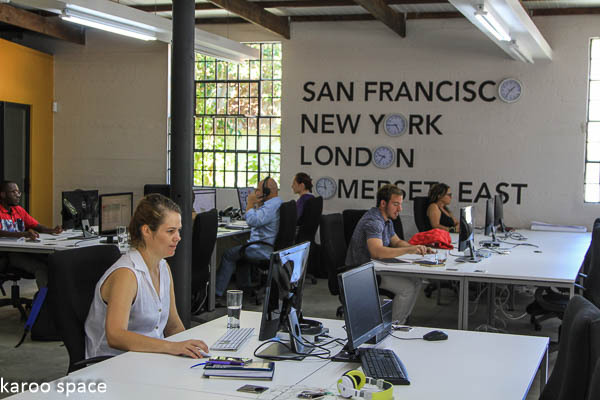 George Groves, co-founder of the Karoo Tech Hub, at his desk in the large airy offices. George studied engineering, spent time in Spain, became an investment banker in London, got into the food business and then sold it again. Meanwhile, Priscilla travelled almost everywhere – including Argentina, Chile and the US – working with top advertising agencies as a copywriter, then plunging into a world of voice-overs and corporate videos and productions. She also met and finally married a charming software developer from Dublin – James Kennedy. One day, James’ partner Richard Greenane mentioned a strange coincidence. In the space of one week, three people had approached him to ask if he knew of a user-friendly purchase order app. James and Richard had a Eureka moment. “I was tired of trying to persuade people to buy into things I thought was a good idea. I realised this was something people really wanted and needed and we could supply it to them,” explained James in his soft Irish burr, his image and voice beamed from Dublin into the Karoo Tech Hub’s eccentric meeting room. 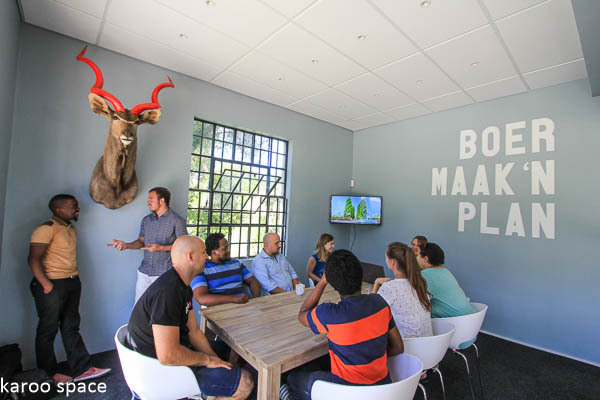 The eccentric meeting room in the Karoo Tech Hub – complete with kudu horns. And that’s how Rubberstamp (http://www.rubberstamp.io) came into existence. This purchase order software is now being picked up and used all over the world by organisations like UNICEF, Clarins and hundreds of smaller companies, including schools, hospitals and construction firms. Meanwhile, his wife Priscilla and her brother George were starting to collaborate on creating ‘explainer videos’, using animators and creative people from all over the world to make videos for companies. Their company, called Piehole TV (http://www.piehole.tv) also has an impressive client list – so far including the CISCO, Emirates, Danone and Chicago Mercantile Exchange. Both companies were and are completely mobile. Since they could choose anywhere in the world with reasonable internet speeds, Priscilla, James, George and his South African wife Christina wondered where they might live and work. They had almost decided on running the company remotely, hiring people from all over the world while living on a beach in the south of Spain. But when James and Priscilla came back to visit Somerset East (she was pregnant with their first child Max) they realised they could have the best of all worlds in the Karoo. 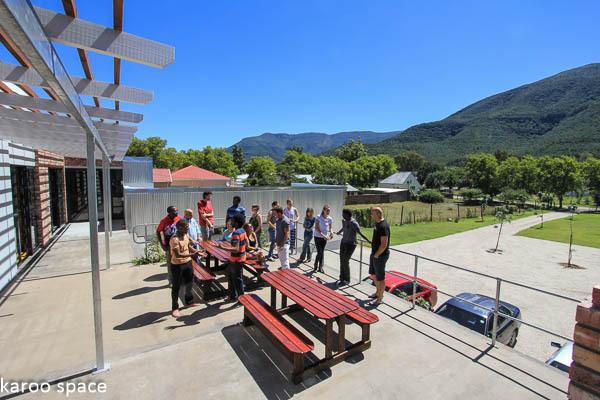 Karoo Tech Hub under the Boschberg Mountain. By then, George and Christina (who had worked in advertising in Johannesburg) had two children with a third on the way, and these two young families rented office space in a small house off the main road in Somerset East – much to the delight of their father, mother and the town inhabitants in general. But love, family support and local pride weren’t the only upsides. The Groves and Kennedy’s found that exchange rates worked in their favour and allowed them to pay for quality work in South Africa at prices that even small start-ups back in the real Silicon Valley could afford. And while India and China may offer equally cheap information technology services, South Africa has closer cultural understanding with London and Los Angeles. The fact that South Africa is in roughly the same time zone as the UK and Europe doesn’t hurt either. The clincher, for James the Irishman, was how hard-working and practical South Africans are. The two companies thrived, and the house they had rented became ridiculously small, crammed with desks and people and bursting at the seams. They needed something way bigger. Just off the main road, and metres away from George and Priscilla’s mother’s clothing shop, they found a large building used by a panelbeater. They took it over and transformed it into a bright, open high-tech workspace. Piehole and Rubberstamp moved there in October 2016. 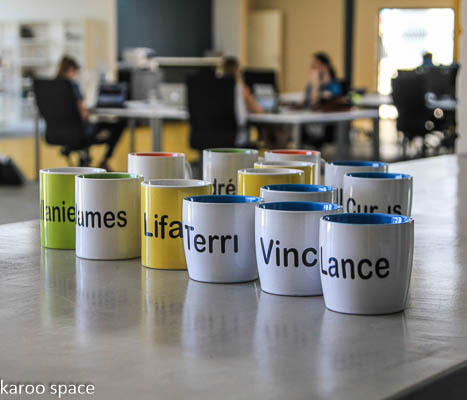 There are clusters of people working behind large screens, or standing around a table and collaborating, or sitting quietly and reading something from the library, or heading off to the coffee station for another caffeine fix. Outside there is a jawdropping view of the majestic Boschberg – something that would be worth millions alone in a big city – along with a large braai area, a table tennis set-up, and a great little movie theatre (with a popcorn machine). On the other side of the building is the basketball hoop to get everyone away from the screen at regular periods. “I am incredibly proud of our team. Every day we beat out competition everywhere from London to LA. Creatively, I have had the chance to work on some of the biggest brands of my career,” says Priscilla. Terri-Maree Rens, who puts the scripts together for Piehole TV. For Terri-Maree Rens, raised and educated in nearby Aeroville, it was an incredible opportunity. 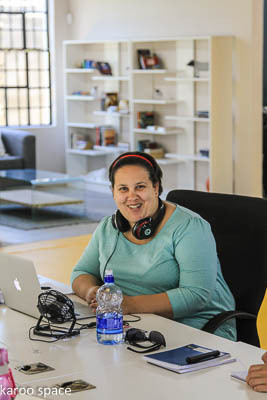 She had a degree from Rhodes University, had worked at Ecological Restoration Capital in Cape Town and was back home wondering what next when she heard of the Karoo Tech Hub and that they were hiring. Terri now lives in her old family home, among childhood friends, can be at work half an hour after waking up and has become central to Piehole – she does the scripts and the storyboard that the animators take over and illustrate. Some of the very urban-oriented animators are a little boggled by the rural life outside of their computer screens. Three of them sit clustered together, working under a hectic deadline to produce a new 5-minute video for the Jewish Board of New York. Lance Marumahoko, graphic artist at Piehole TV. Lance Marumahoko was living in Pretoria when he saw something on the Biz Community newsletter about a new company looking for his skills. He sent them a CV, then examples of his work and moved to Somerset East to join Piehole TV in March 2016. “It was a bit of an adjustment. In Pretoria I was living above a nightclub. Here the silence kept me awake at night.” He’s not sure he’ll settle forever in a small town, but doesn’t miss the city traffic, and definitely not the club soundtrack. Mluleki Manyase, who came to Somerset East from Cape Town, says rural life gets a bit much when cows wander onto the property. 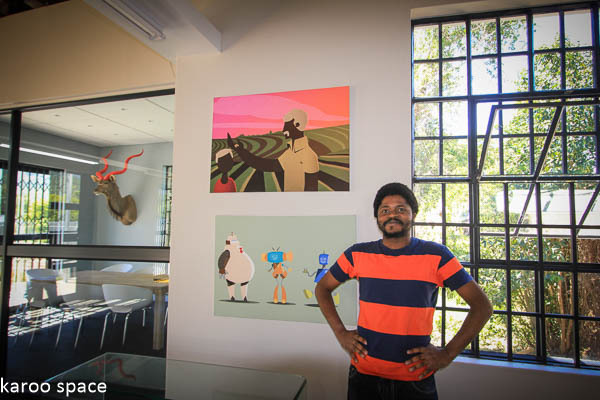 Seni Mtshali was living in Johannesburg when he saw an online advert for this job. 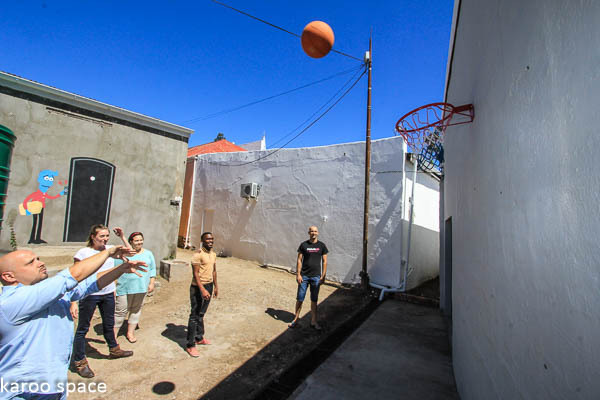 A pick-up game of hoops – a break-time favourite at the Karoo Tech Hub. We caught up with Vincent Hocking and Lifa January just as they were heading out to play hoops as a compulsory break from the computer screen. Both work for Rubberstamp. Vincent says he had been in the hospitality business in the area but was looking for something new. He saw the advert and took a chance, despite knowing nothing about software. His service experience turned out to be perfect for customer care. Lifa had been working at the local Spar as a merchandiser and shelf-packer when he heard about the job opportunities here. The only thing slowing job creation at the Karoo Tech Hub is South African internet speeds. George says: “We don’t have fibre here so we get between 3 and 6 Megabytes a second. Maybe 10 on a good day, compared to 480 Megs a second in Europe. The Karoo signature at the Karoo Tech Hub in Somerset East. The two companies hire about 25 permanent people between them. Often there’ll be additional part-timers, as needed, from Argentina, Vietnam and Poland. For more information, see rubberstamp.io, http://www.piehole.tv or http://www.karootechhub.com. Wow, what a positive story! 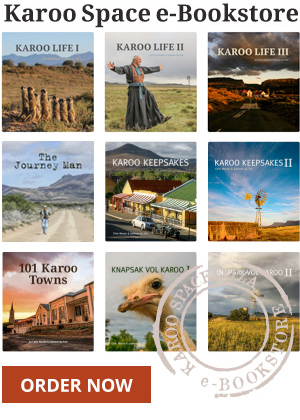 Thanks for the report and all the best for the people of Karoogle. Wonderful good news stories. Well done to them all and may success flow smoothly.